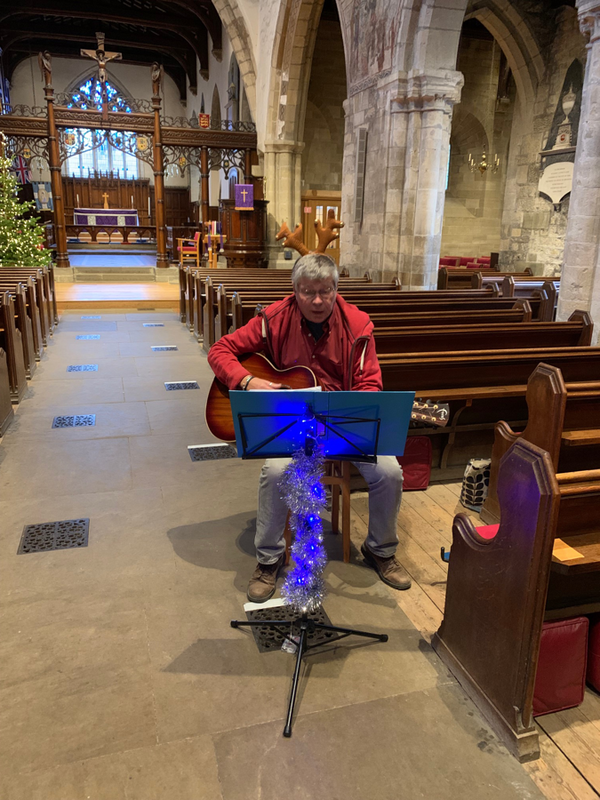 We are always looking for new and exciting ways to raise funds for our magnificent building and for the wider church in the diocese and beyond. Here are a few of our activities for you to enjoy. anything you purchase through their pages gives us a percentage profit without any additional cost to you. So if you shop at any online retailers, it is well worth looking to see if they are covered by a Easyfundraising before you place your order. Use easyfundraising to shop with over 3,300 retailers including Amazon, Argos, John Lewis, ASOS, Booking.com, eBay, Boden, and M&S. Every time you shop, you’ll raise a free donation for Pickering Parish Church every time, it’s that easy! We held our annual Pancake event in the Church Hall this year, as the lighting work is still ongoing in the Church. We had anticipated slightly fewer visitors because of this, but were actually busier than last year! We made well over 100 pancakes and raised £205 from donations, which will be considerably more after the Gift Aid is claimed. A huge thanks to everyone who came along and supported us and helped to make this such a jolly event once again. I'm afraid we didn't take any pictures as we were kept so busy! Once again the tickets sold out like 'hot cakes' for the afternoon tea. The date had to be changed at the last minute, but almost everyone managed to come along on the revised date. We had a fabulous day for the Christmas Fair and raised over £1000 after expenses. As well as Father Christmas and lovely live music from Ells Bells and The Sweet Martinis, we had a Jewellery stall, cake stalls, Scalextric, Splat the Rat, Throw snowballs down the chimney, Bottle and Chocolate Tombolas, Book stall, Guess the weight of the giant sprout, Where's Rabbit been on his holiday?, Coin balancing, Find the golden ticket in a Cracker, and great refreshments. Huge thanks to everyone who came and supported us. Once again we provided refreshments for the 'army' of visitors who descended on the town for this very popular 40's weekend. We were very fortunate to be able to use the church as usual, as the building work has almost come to a close. We served a variety of scones and cups of tea or coffee and raised well over £1000. A huge thank you to all the people who got up early to bake the scones and to everyone who helped on the day. We had a lovely Harvest supper on 29th September in the Parish Hall. Vegetable soup and a roll was followed by a cottage pie with buttery cabbage. Apple and blackberry crumble and custard for pudding, then coffee of tea and truffles. 'Alum Pie' entertained us with gentle singing between the courses and Steve Bulmer gave us a hilarious auction of produce. We had a raffle too, and the whole evening raised £424 which was brilliant. Everyone had a lovely evening and the atmosphere was fantastic. We had an absolutely fabulous day for our Grand Summer Fair on 4th August. A huge thanks to our helpers and to everyone who came and supported us. Here's some pictures of the day, thanks to Barry Potter. ​We held a Beetle Drive on 7th July and had a really fun evening! The buffet supper was fabulous as always and everyone had a fabulous time. Although it was primarily a social event, with the raffle, we raised almost £160! Huge thanks to everyone who came along and supported us. We held an Afternoon Tea on Saturday 9th June. Always a very popular event, so the tickets sold out very quickly. Huge thanks to Ali, Janet and Cait for the catering - it all looked and tasted delicious. Coffee, tea and scones are available in Church every Monday morning during the summer months to coincide with the town’s weekly market. This is a great way to catch up with friends, new and old, over a scone and a hot drink, and all for a very reasonable price! This year we start on Monday May 7th. ​Because of the work starting in the Church at the beginning of July, we will not be holding them over the summer, but will resume in the Autumn as soon as the work is finished, and will run through November and December. On the day that the Tour de Yorkshire came through Pickering, we held a free cakes and a cuppa event which was very well attended. 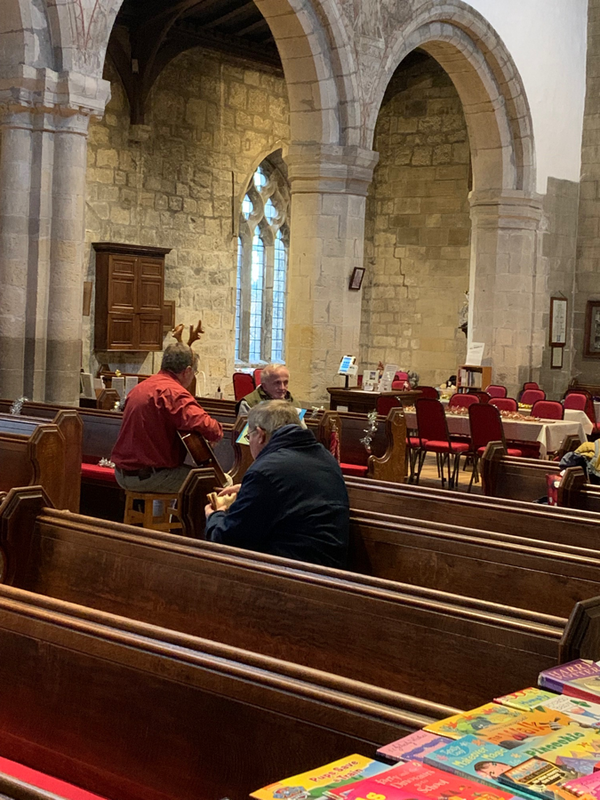 We hosted the Induction of Churchwardens on May 3rd, welcoming lots of churchwardens from around the diocese, many who had never been to our church before, so there was a great deal of appreciation for the paintings as well as our 'hidden kitchen'! It was a great pleasure to be part of such an important event, and there were plenty of cakes and refreshments to share..
​Sixteen Pilgrims had a wet but wonderful pilgrimage to Walsingham. Fr Antony and Gill were greatly missed, but we look forward to them being with us again on our next visit. A huge thanks from all the pilgrims go to Archdeacon Richard Seed and Fr Michael Sinclair who lead us so very well over this special weekend. 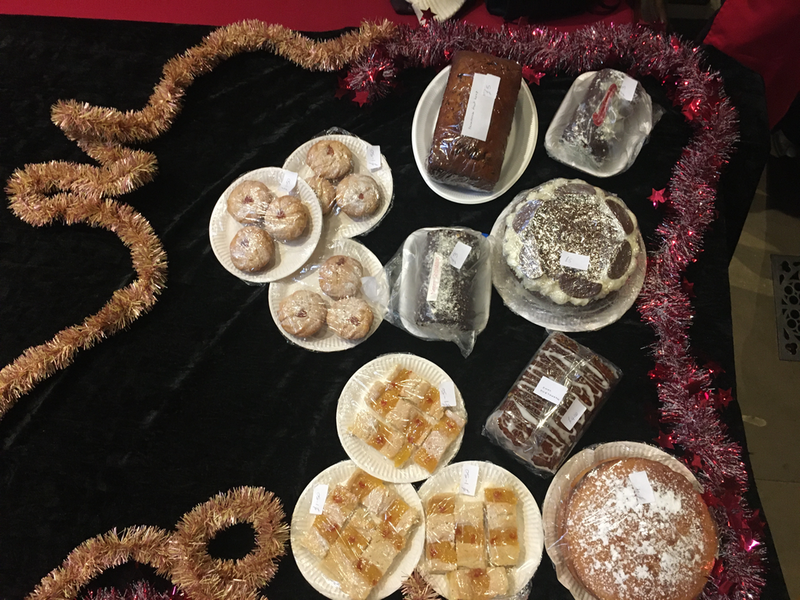 Our Cakes and Bookstall in the Market Place on Saturday 14th April raised a magnificent £263 for church funds! The weather was very kind to us and we had a good stream of folk wanting to buy. All the cakes and jams were sold by 11.30 so we packed up the stalls. 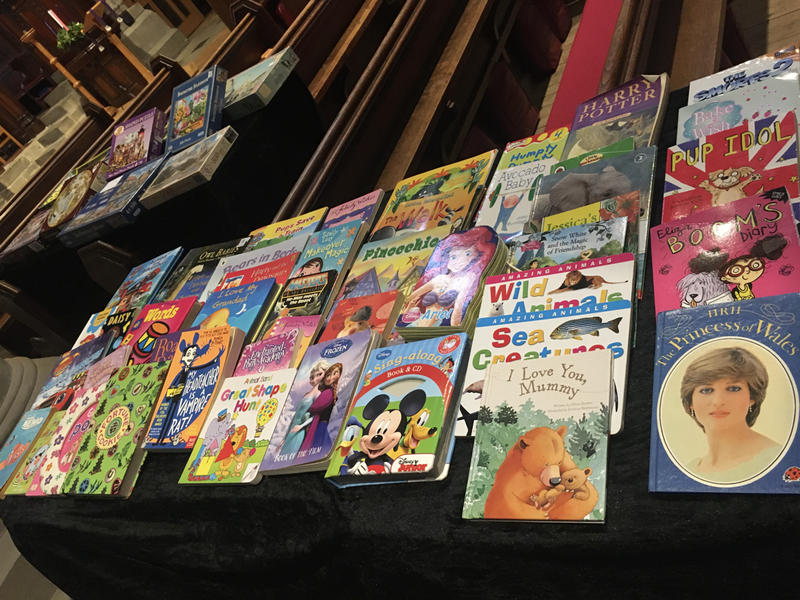 The remaining books will be for sale at the Monday Coffee Mornings which start up again on Monday 7th May in church, from 10am until noon. ​A huge thank you to everyone who donated cakes and books and to all who came and supported us on the day.